Spring is most definitely in the air and wedding season has begun! Clock Barn is buzzing as we prepare for months of wonderful weddings and we can’t wait to welcome our couples and their guests. 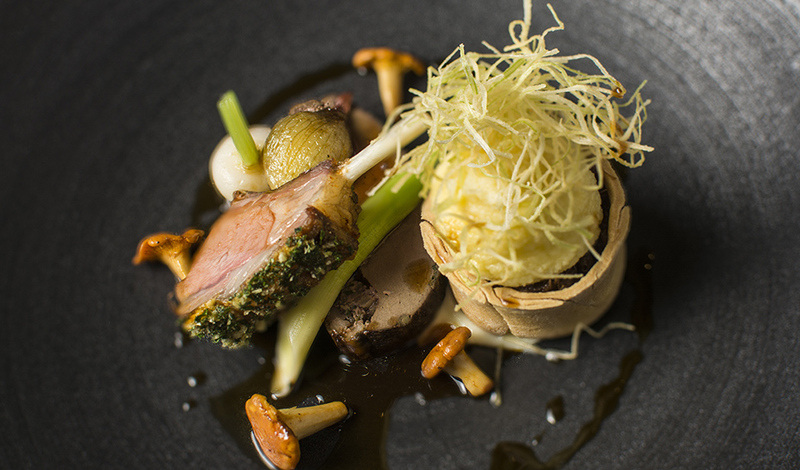 We’re also looking forward to serving lots of fabulous food and drink because our catering partner, Galloping Gourmet, have created the most mouth-watering menus for spring. These carefully crafted dishes will make sure your wedding food is memorable for all the right reasons and your guests won’t be able to resist a second drink either! 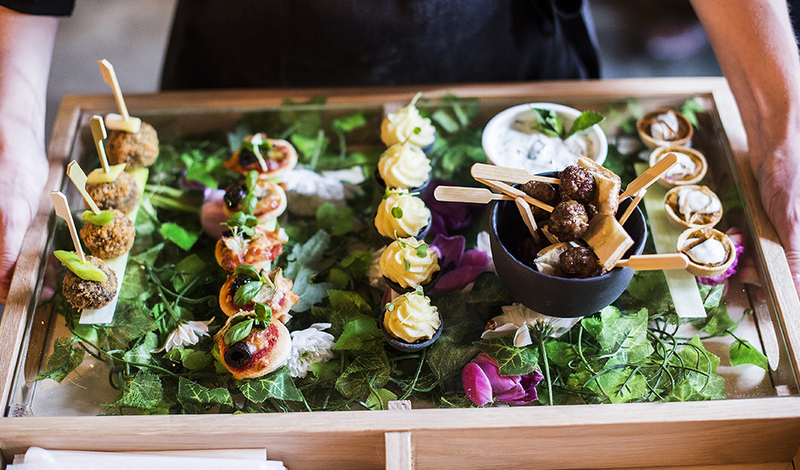 For some delicious spring wedding ideas and suggestions for seasonal wedding catering, read on. Fresh tasting cocktails are perfect for spring. How about mojitos or a fruity sangria? 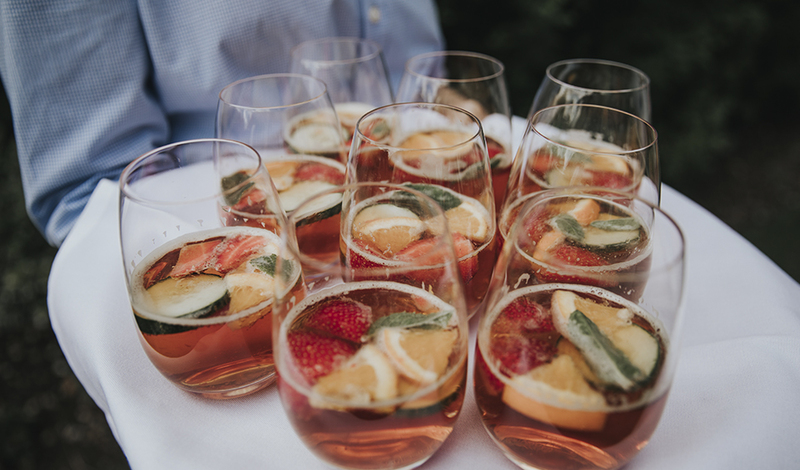 Pimms is another classic choice or you could opt for the Galloping Gourmet Gin Bar, complete with a selection of gins, tonics and botanical garnishes. Mocktails are a great option for non-drinkers. Elderflower sparklers or the on-trend Cosmo-not that features peach, cranberry and a twist of lime will make everyone smile. If you love a great ale, why not choose from Galloping Gourmet’s list of guest ales? 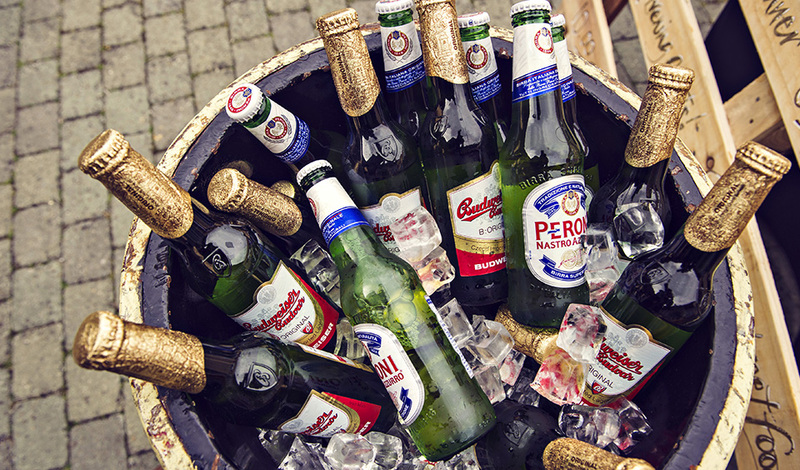 The keg makes a fab focal point during your drinks reception and these are always really popular. Moving on to canapes and a wonderful choice awaits. 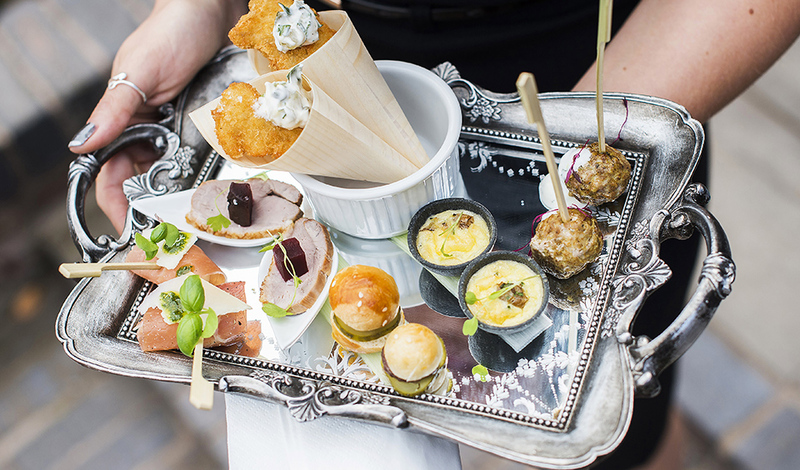 Scaled-down versions of classic favourites such as mini fish and chips, mini burgers and mini Yorkshire pudding with roast beef and horseradish cream will satisfy even the hungriest guests. 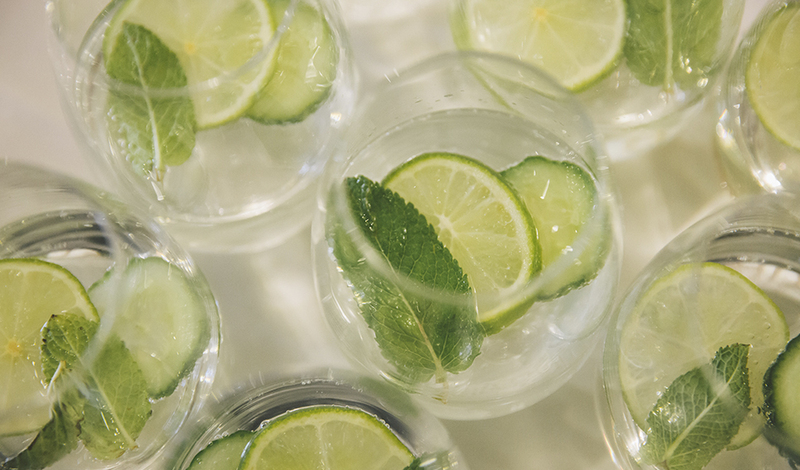 To bring a little spice to your spring drinks reception, why not serve spiced sticky chicken wings with toasted sesame seeds, Thai chicken with a sweet chilli glaze or skewers of curried lamb with a mint yoghurt dip? In early spring, there can still be a chill in the air so keep guests warm with delicious warm tartlets featuring seasonal ingredients or deep-fried Thai fishcakes with chilli sauce. 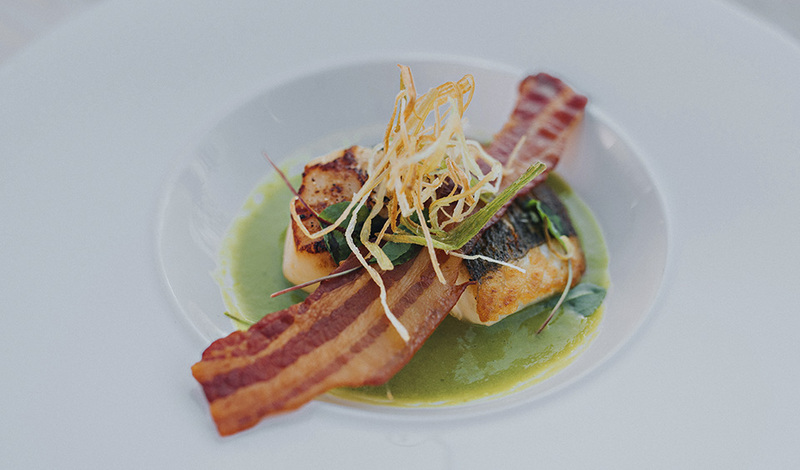 Start your wedding feast with the best of the season – spears of warm asparagus with soft poached egg and hollandaise sauce or seared scallops with minted pea puree, crisp pancetta and pea shoots would be wonderful choices. Or, embrace the new trend for slightly sharp and bitter flavours. Chargrilled tiger prawns with a crab salad and caramelised lemon or a salad of crispy duck with cucumber and mouli salad and star anise vinaigrette will definitely whet the appetite. A main course of spring lamb or a light roast fillet of salmon with a Nicoise crust, minted new potatoes and a lemon and chive butter sauce are true seasonal delights. 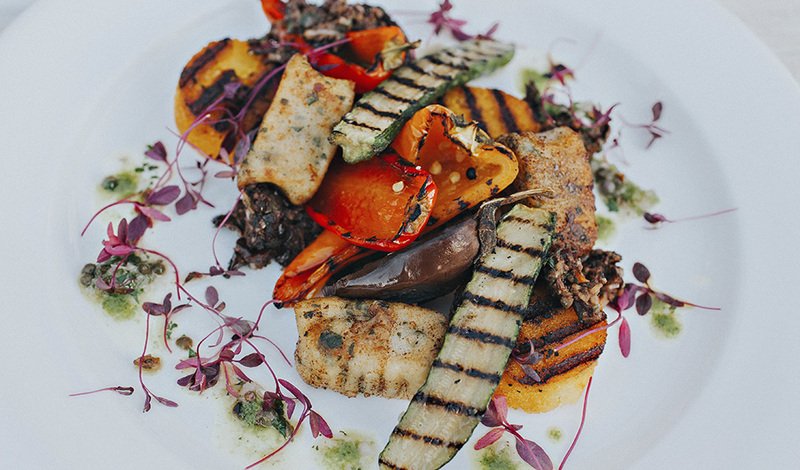 Vegetarian and vegan guests can also look forward to fantastic wedding food at Clock Barn. Start with a mushroom Scotch egg or steamed asparagus with burnt cucumber and toasted chickpeas and a smoked garlic and paprika houmous and follow these with Dukka spiced grilled aubergines with red lentils, salsa, steamed wild rice and pine nuts or a fine plum tomato tart with black olive tapenade, vegan mozzarella and wild rocket. If you’d prefer a more relaxed wedding breakfast, Galloping Gourmet’s casual dining menu is just what you need. You could opt for a spit roast main course, a barbecue or a gourmet buffet featuring meats and seasonal salads along with vegetarian options. Every wedding breakfast needs to finish with an indulgent dessert and there are so many wonderful choices for spring weddings. A glazed lemon tart will clear the palette or a classic Eton mess hints that summer is just around the corner. 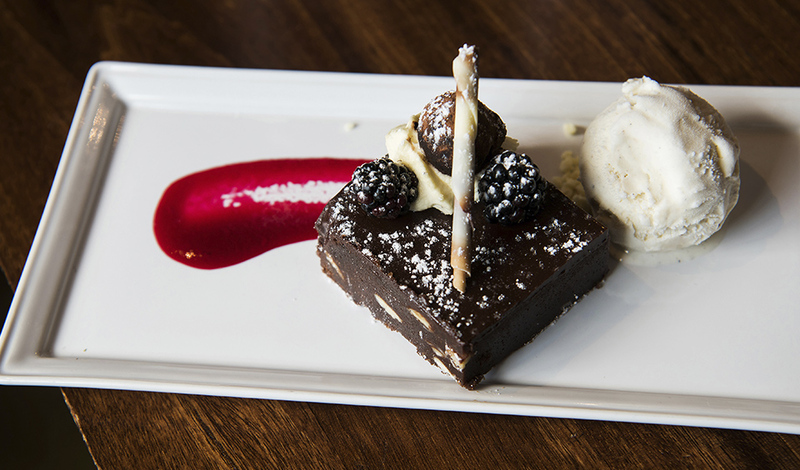 That said, Galloping Gourmet’s triple chocolate brownie with vanilla ice-cream is superb at any time of year! Wedding food for evening receptions has undergone a massive transformation in the last few years and now, there are so many amazing options. It’s important to remember that wedding days are really long days and if you want your guests to still be dancing when the final song of the night is played, evening food is a must. 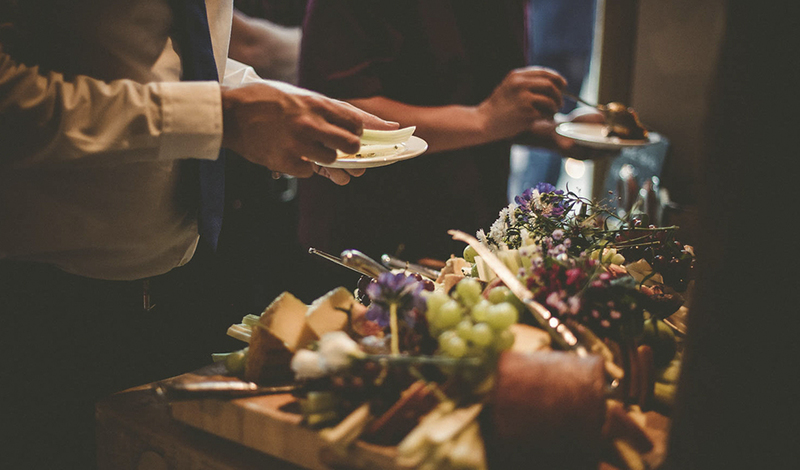 Serve your chosen food midway through your evening reception to help everyone recharge their batteries. And, why not offer guests another drink too? Cocktail stations are great for your evening reception and guests LOVE them! 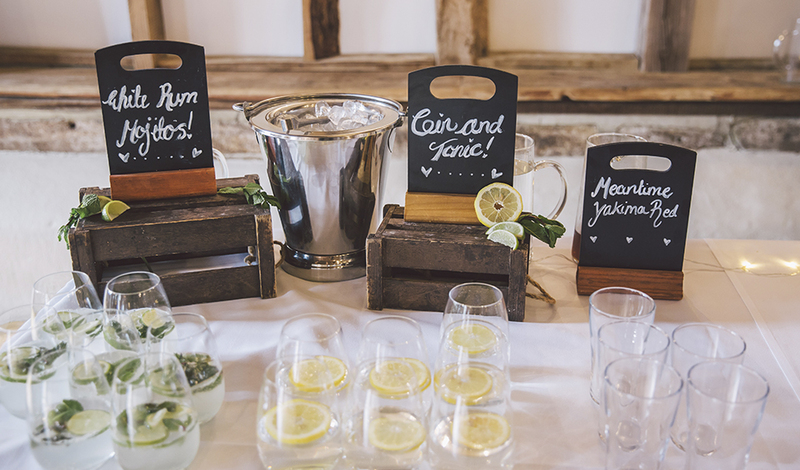 Choose from a mojito, martini, hard lemonade or rum punch stations and let your guests enjoy their favourite mix. 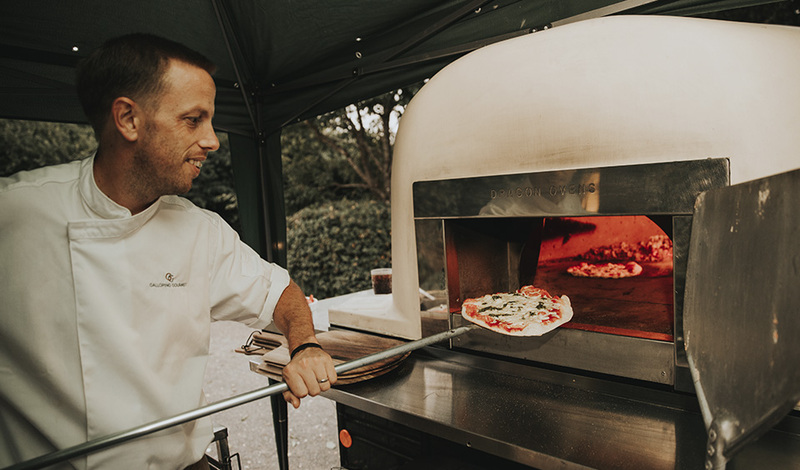 As the evenings get warmer, encourage guests to get outside for their evening food as they enjoy wood-fired pizza topped with a range of gorgeous extras. A firepit barbecue or spit roast makes a great visual treat for your evening reception. 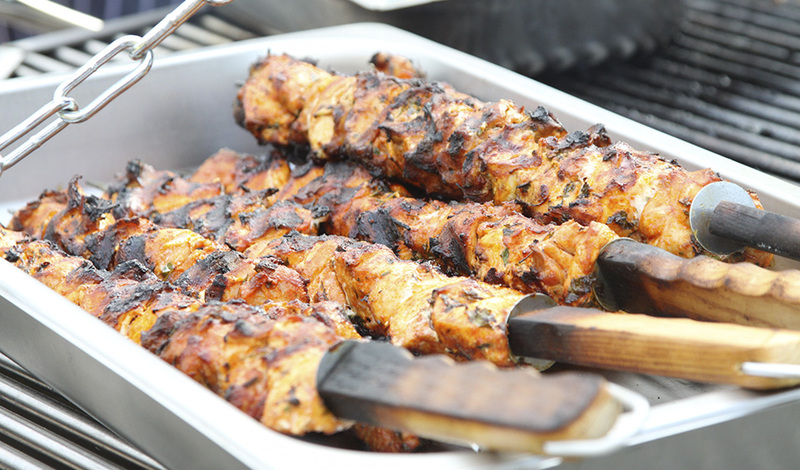 Grilled chicken kebabs or burgers are served straight from the charcoal barbecue or go for a whole spit roast pig with crackling if you really want a treat! If you love Chinese and Thai food, why not opt for some wok food? 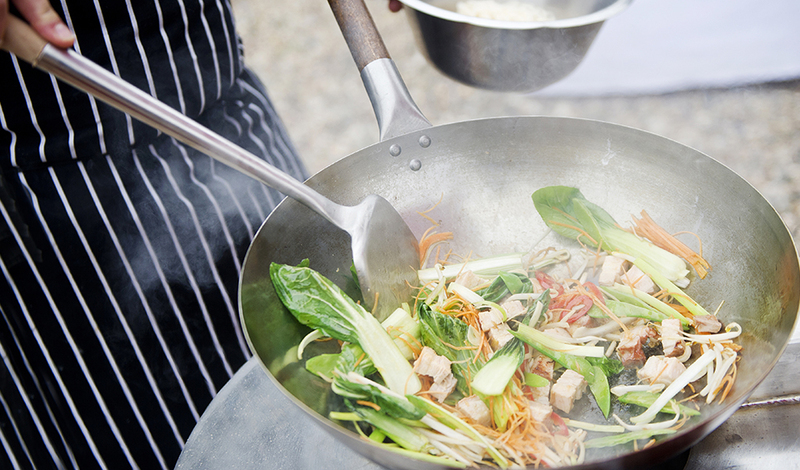 Cooked outdoors in huge pans and woks, street-food style, your guests will love ginger and black bean spiced belly of pork with stir fried peppers and soy cooked noodle or even lamb and chickpea Thai green curry with mange tout and coconut cream. 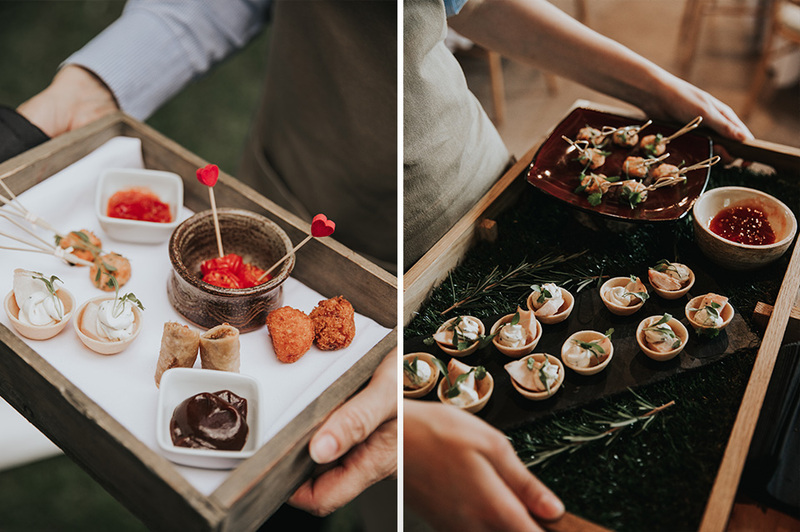 The trend for artisan grazing stations is definitely here to stay and Galloping Gourmet’s tasting selection is the ideal choice for committed foodies. Cheeses, breads and dipping oils are served with a hand-carved leg of acorn-fed Iberico ham and chicken liver parfait in individual Kilner jars. Finished with shots of chilled white port, this is the ultimate in wedding decadence. Finally, those traditional wedding favourites are also perfect for spring weddings. A charcuterie board, a traditional evening buffet, light bites or hot dogs and steak sandwiches are all on offer too. We promise that your guests won’t go home hungry! To find out more about the latest wedding food options from Galloping Gourmet, just get in touch. 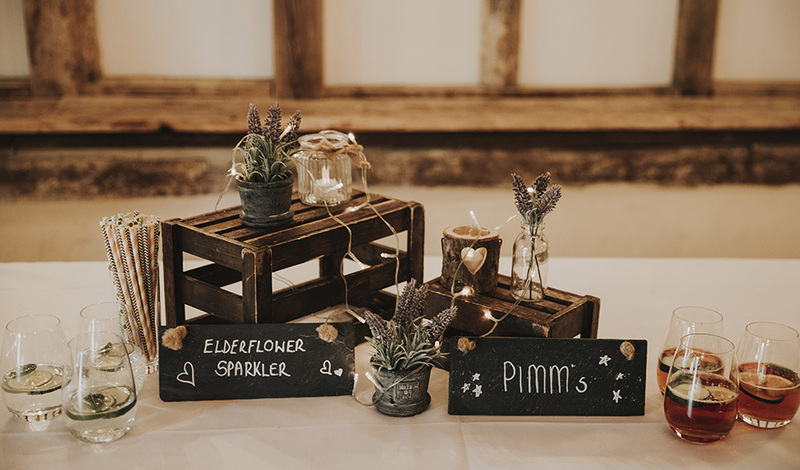 Remember, when you host your wedding at Clock Barn, you’ll be invited to a tasting event before your wedding so that you can try a whole host of options. We want your wedding food to deliciously memorable. If you’d like to see Clock Barn looking its seasonal best, take a look at Emily and Tom’s beautiful spring wedding or get planning with these spring wedding ideas for ceremony decorations.